For some the news that Southampton defender Virgil van Dijk has chosen Liverpool over Manchester as his summer destination will be welcomed with a sigh of relief. On Monday afternoon Times’ journalist Paul Joyce announced that the player believes his career would be best served under Jürgen Klopp, marking an unforeseen U-turn on reports that City were set to sign the defender when the July transfer window opens. The 25-year-old’s preference for Klopp over Pep Guardiola is certainly feasible though the suddenness of all this suggests a spanner has been thrown in the works somewhere. After all, the news comes just four days after Joyce himself published an article with quotes from Liverpool’s chief executive Peter Moore insisting the club would not be panicked into changing their transfer strategy to keep up with City’s. In just four days Liverpool have maneuvered themselves into a position whereby they now must pay a world record £60million fee to sign a player they had no intention of competing for. City have proven already this summer that money will not be an issue. Having acted quickly to secure the £43million signing of Monaco playmaker Bernardo Silva it seemed Guardiola had instructed Txiki Begiristain in more formal and polite terms to essentially quit the fooling around and get me my men. The goalkeeper and full-back positions have been justifiably prioritised by the Catalan but behind those areas, from the perspective of a fan at least, the team could also benefit from reinforcements at centre-back where City looked particularly shaky in Pep’s first season in charge. 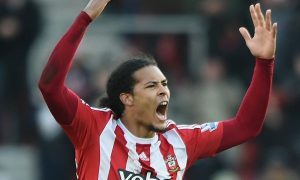 According to Goal.com journalist Sam Lee, City had put Van Dijk at the top of the list for the position should they go into the market. So if money is not going to be an obstacle between City and their top transfer targets this summer, surely City aren’t in the market for a central defender? I wouldn’t bank on it. Vincent Kompany has been emphatic since returning from injury but Guardiola has reiterated concerns over the Belgian’s fitness. Kompany’s return highlighted the importance of a dominant centre-back, with Stones and Otamendi in particular benefiting from the captain’s presence. Stones is expected to kick-on next season and become a linchpin of the side but there is an awareness among City’s managerial staff that the 23-year-old may need to be partnered with an experienced player to coax the best out of him. While in an ideal world Kompany would be that partner Guardiola knows he can not afford to place all of his eggs in one basket with him. A wishful thinker would hope that a certain Leonardo Bonucci had been on the phone just seconds after Juventus’s Champions League final defeat offering up his services to the club, though unfortunately there’s nothing to suggest the Italian is about to turn his back on the Serie A champions. For £60million however, City would expect to test the Old Lady’s resolve for their most illustrious centre-half. And that’s where I believe the issue with Van Dijk lies. For £60million, and even acknowledging the fact that Van Dijk has been one of the Premier League’s best defenders for two years now, City would make any team in the world sit up and listen to offers for any defender in the world. Should City decide to break the world transfer record for a defender they must ensure to the best of their ability that they choose the right man. Since 2008 when Kompany was signed for £6million as a 22-year-old from Hamburg City have tried and failed miserably to seek an adequate partner for him in the heart of defence, wasting around £80million on Stefan Savić , Matija Nastasić, Martin Demichelis, Jerome Boateng and Eliaquim Mangala. At £24million Joleon Lescott remains Kompany’s most sound companion, though City still paid way over the odds for a middle-grade defender. Nicolás Otamendi was terrific at the tail-end of the season but is way too inconsistent, while perhaps a little more was expected of £50million John Stones in his first term at the Etihad. City have such a poor record with centre-backs and another big-money blunder in the position would be unforgivable. Of course, the possibility that Van Dijk simply prefers Liverpool is more than convincing. The idea that City are about to let their ‘top-target’ wriggle free into the hands of a rival, however, is not, and suggests the club are being extra careful with a position they have recruited so badly in for too long.